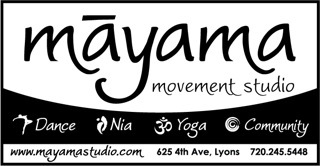 Mayama's Annual Recital is scheduled for May 19th at Longmont High School. The rehearsal is May 18th. All winter session dancers are required to attend the rehearsal and show. Winter Session enrollments will include an additional $85 Costume Fee per class ($50 Creative Movement). Costume fees are billed in February and due March 1st.